The earliest and one of the staunchest supporters of the American Revolution was the Dutch Republic. The British initially ignored the actions of their erstwhile ally, but by late 1780, open war had erupted. What the Dutch call the Fourth English War was an unmitigated disaster for the Republic, apart from the Battle of Doggersbank in 1781 where an out-gunned Dutch fleet fought the British North Sea fleet to a standstill. When peace was signed in 1784, responsibility for the abysmal Dutch performance was dumped on the head of Willem V, Prince of Orange, captain-general of the Republic’s fleet and army and effective head of state. A groundswell of radical opposition, the Batavian party, swept the openly pro-British Willem out of power. French radicals, who needed a safe haven, were welcomed by the Batavians. A truly democratic republic may have developed, but Willem was married to Wilhelmina, sister of the Prussian king. Frederik Wilhelm II sent an army of 20,000 into the Netherlands in 1787. The Batavian opposition collapsed without a shot being fired, and Willem was restored. Many Batavian leaders sought exile in Paris, adding to the growing republican movement there — which would erupt into full revolution less than 24 months later. By 1794, the French revolution had survived both internal and foreign counter-attacks and had begun its first foreign conquests. It drove the Austrian and British armies from Belgium, and aided by Batavian supporters, both in France and at home, General Pichegru invaded the Dutch Republic itself during the winter of 1794-1795. Willem’s largely mercenary army collapsed, but to the chagrin of not a few politicians in Paris the Batavians declared a new independent republic in Amsterdam before French armies could occupy the city. The Batavian Republic was allowed to survive as a French ally, but was saddled with a huge war indemnity, agreed to maintain its battle fleet and a field army of 25,000, and also had to pay for a 20,000-man French garrison (although these 20,000 men were rarely in the Netherlands). The Batavian fleet was mauled at Camperdown in 1798, part of a failed effort to invade Ireland, but the army put up a creditable performance the following year, defeating an Anglo-Russian invasion force in North Holland. Still, the French believed they never got full value out of their Dutch ally. The myth of limitless Dutch money persisted, but most Dutch investments had been in speculative bonds and there was little real cash to be exploited. The Dutch government persistently refused to implement national conscription, frustrating French demands for more manpower. The Dutch also refused to implement the continental blockade, which would have led to total economic collapse. The Emperor Napoleon attempted to get more secure control of the region following the Jena campaign of 1806. The Dutch, while having no hesitation to fight the Prussians, had refused to violate the territory of minor German states with which they had no argument. Napoleon abolished the Batavian Republic, and reformed it into a kingdom under his brother Louis. However, Louis proved to be no puppet, and so identified with his new subjects that he learned Dutch and probably protected Dutch interests better than they could have done themselves. In growing frustration, in 1810 Napoleon convinced his brother to abdicate and annexed the Netherlands outright. But this still did not solve the manpower and money issues. Conscription met with widespread opposition and rioting. The continental blockade was imposed, but many traditional enterprises collapsed while the rate of smuggling ballooned. In 1810, Dutch army regiments were integrated en masse into the French army. While given French regimental numbers, they remained as distinct ethnic units under their old officers, sometimes even wearing their old uniforms. While Napoleon denigrated Dutch military performance, he took an entire regiment of cavalry into the Imperial Guards. He also took the Dutch guards regiment and re-named it as the 3rd Regiment of the Imperial Guards, complete with their white uniforms. Aside from a regiment of Polish lancers, no other foreign troops served as distinct ethnic units in the Guards. The 1812 campaign in Russia proved to be calamitous for Napoleon, but it was a complete disaster for the Dutch army. Of the 20,000-plus Dutch soldiers serving in Russia, only a few hundred returned home (most had fought with the rearguard at the Beresina). As Russian troops crossed the Dutch borders in 1813, a full-scale rebellion against the French broke out and the son of Willem V (who had since died), Willem Frederik, returned and became Willem I of a new Kingdom of the Netherlands. The Dutch Republic held an ambivalent position in the Napoleonic era. Once a great power, the center of a coalition against the France of Louis XIV, the republic had long fallen from even middle power status. Still, the Dutch had a huge colonial empire, and the mystique of its wealth and naval power had not entirely disappeared by the time of the French revolution in 1789. The rapid collapse of the Dutch army in 1795 still had come as something of a shock. The Dutch managed to maintain a precarious independence as a French ally, even under the reign of Napoleon, for a decade and a half before the annexation of 1810. But the French occupation of Holland would last less than three years, and before the end of 1814, a new Dutch kingdom would be established which continues to this day. The following rules attempt to reflect Holland's ambiguous role within the framework of Soldier Emperor. Beginning forces are 1 Netherlands Army and 1 Netherlands Fleet (reduced), placed in Holland (the maximum force pool for the the Batavian Republic is 1 Army and 1 Fleet). Recovery level for the Batavian Republic is 1. Reduce French at start forces by one army. The Netherlands Army may only move in Holland and any adjacent land areas (Calais, Kleves and Hannover). The Netherlands Fleet is not restricted. France collects 1 Money from Holland during the Money and Manpower Phase as long as the Batavian Republic exists as a French minor ally. (This represents the indemnity placed on the Dutch and the monies required to pay for the 20,000 French “garrison” troops). The Batavian Republic may neither be “stolen” by another power (17.6), nor “stabbed in the back” by France (16.3). As long as the Batavian Republic exists the Holland card (19.3) may not be played. France may annex the Batavian Republic simply by stating this intent during the Diplomacy phase. The Batavian Republic immediately ceases to exist and Holland is treated as a French home area. The Netherlands fleet may be kept and is subject to usual game rules (see the relevant section in 19.3). The Netherlands army is removed and any one reduced French army may be brought back up to full strength (including the Old Guard), or a new French army (reduced) may be placed in Holland. Once annexed, the Holland card may be played as usual with all the provisions of 19.3. While Holland is a French home territory, France may collect only 2 Manpower and 2 Money from it. If, before any French annexation, the Holland area is controlled by any other power than France, immediately remove any Netherlands units. The Batavian Republic ceases to be and the Holland card may be played as usual. If France regains control, treat Holland as a French home territory subject to restrictions above (2 Manpower and 2 Money). 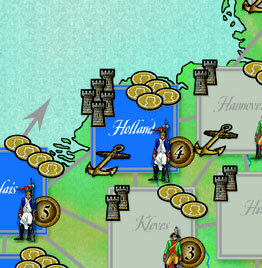 For Victory Points, Holland counts as any other minor area (worth 5 VP to the French, for example). Once annexed, however, it counts as a French home area (and so generates no VP for France), until or unless the Holland card is played. When using this option, the French automatic victory level is increased to 40 points while the Batavian Republic exists. If the Batavian Republic ceases to exist, for whatever reason, the French automatic victory level is decreased to 35. 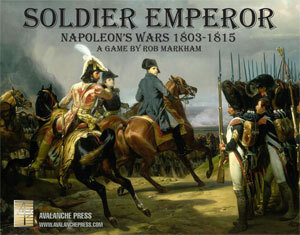 Click here to order Soldier Emperor now!